rice flour and tapioca flour and xantham gum, oh my! many of you know how much i love to bake, and some of you have even been lucky enough to enjoy some of my treats. now, since i no longer have an office to go into, i had to figure out what to do with all my baked goods, because keeping a whole cake or tray of cookies in the condo with just phillip and me is out of the question. we’d be too tempted to eat it all ourselves! so, i started baking things phillip could take to his coworkers. he’s relatively new at his job as well, and there’s almost no better way to make friends in a new place than coming in with something tasty to share with everyone. “well, i guess i need to find some gluten-free recipes, then!” so, discouraged not and determined much, i was on the hunt, and since i know nothing about gluten-free baking, i took my search to social media and relied on my trusty facebook friends to lend a hand. luckily, within what seemed like just minutes, several folks responded with suggestions – what great people! after perusing the suggestions, we finally decided that this gluten-free chocolate chip recipe would be the way to go. it is a classic and cookies are easy to share, so it seemed like it had potential to be a winner. nothing about the recipe itself scared me away; however, i had to be sure we had the right gluten-free ingredients on hand, so off to whole foods i went! i made a beeline to the baking aisle and was astounded at the variety and number of alternative baking ingredients out there. who knew such a world existed! after checking the shelves, checking my shopping list, and checking my shopping cart again, i was ready to go. back at the condo with the necessary supplies flung around the kitchen, it was time to get to work. step by step everything came together nicely, and phillip can confirm that the batter itself tasted as delicious as any one of your favorite gluten-full chocolate chip cookie recipe batters. that’s got to be a good sign! but, the real test would be when the cookies were baked, cooled, and ready to eat. as stated in the recipe, i tried baking them for 14 minutes per sheet, rotating halfway through, but those batches were a little more golden than we prefer, likely due to our oven running a little hot. so, we bumped it down to 12 minutes total and ended up with a pretty delicious result. i mean, we just had to taste test a couple of cookies each, washing them down with an ice-cold glass of milk. with new-found gluten-free confidence, we packaged the cookies up, wrote up a little note and ingredient list, and phillip took them to the office the next day. i almost couldn’t concentrate on my own work, i was so eager to hear if they were liked! i got a text from phillip in the afternoon that people were loving the cookies and were appreciative that we took the time and money to go out of our way and make a gluten-free recipe. ah! success is ours! now, we could have stopped there, content with the joy our cookies brought phillip’s co-workers. however, the baker in me was too intrigued and had to keep going. one of my own colleagues recommended to me a book called alternative baker, and i have been conquering it like there is no tomorrow! from the corn meal blueberry muffins to the no-bake oat bars, everything we have made so far has been a hit and there is only more to explore and create. what more could a baker ask for, right? right! if you’re someone out there who has a sweet tooth like us but has some dietary restrictions, i highly recommend giving this particular recipe and this book a try. the baking world is full of so many creative options, and who knows, maybe you’ll surprise yourself with a new favorite. 🙂 enjoy! i love my beets cold, cooked, or now, as i recently discovered, in cracker form! that’s right, it’s the cracker i’ve been waiting for my entire life. i was just doing my weekly shopping at the local disco kroger when i moseyed into the cracker aisle, trying to make a snack selection. i could always go with the traditional cheez-its or ritz crackers but then a beacon of light shone directly in the right spot and called me to the good thins beet crackers. i squeaked in excitement, left my buggie in the middle of the aisle, and rushed over to the shelf. i could hardly believe what my eyes were seeing! i immediately threw them into the cart and rushed home so that i could give them a taste. now, as a beet-lover, i had high expectations for these crackers. as i began to munch away, i was waiting for the classic beet flavor to hit me like a ton of bricks but it didn’t quite happen. it really is more of a hint of beet after you take a few bites and, if you didn’t know they were beet crackers, you probably wouldn’t be able to identify them as such. however, i am still ecstatic that the cracker industry is trying to raise awareness about this incredible root vegetable that really has so many health benefits and is quite versatile in the kitchen. from gold beets to red beets, just cook ’em up, pour on some balsamic vinaigrette and sprinkle on some goat cheese and you’re good to go! #beetsforlife! 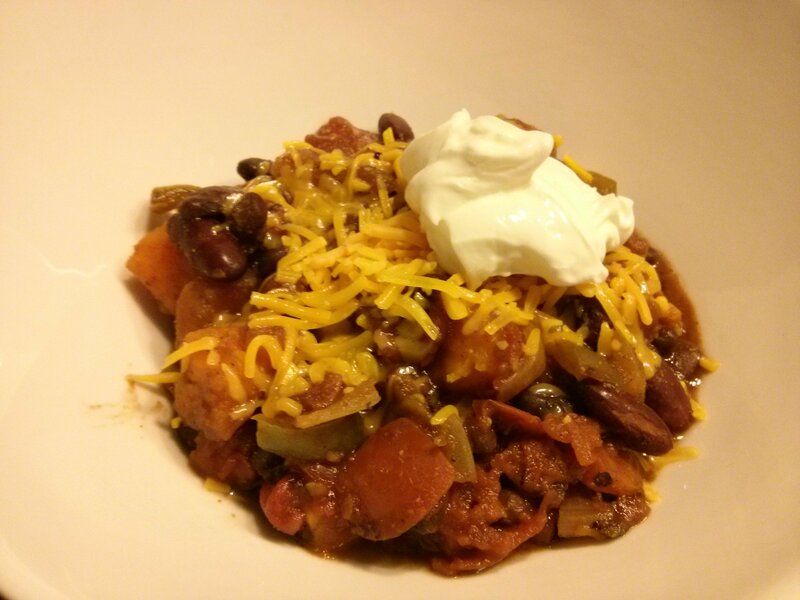 it felt like phillip and i had done an awful lot of eating out lately, so last week i let the crock pot whip up my new favorite dish: vegetarian chili with sweet potato. the recipe comes from the always trustworthy real simple. yes, they did it again with a hearty meal full of deep flavors and rich in nutrients. well, it was rich in nutrients until i suffocated my bowl with a mound of shredded cheddar cheese and a generous dollop of sour cream. no judging! but really, this one is a keeper for sure, and with the cooler months making a delicate entrance this season, i’m betting it will be a repeat before too long.